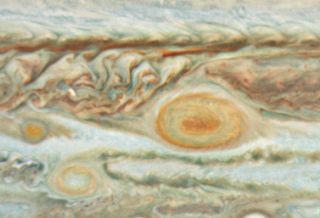 An image of the baby red spot (left), the Little Red Spot (lower left), and the Great Red Spot (right). The image was taken on May 15, 2008 by the Hubble Space Telescope. Jupiter?s Great Red Spot has roughed up a younger rivalstorm and may consume it altogether. The baby red spot appears to have gottenthe worst of its whirlwind encounter with the ravenous super-storm that hasdominated Jupiter for at least two centuries. Theirtussle was captured in a recent series of images by the Hubble SpaceTelescope. Scientists may be watching historical shifts in action asthey learn how the giant planet's storms grow and change over decades andcenturies. The smaller storm firstappeared earlier this year, but had the misfortune to get caught up in thereverse cyclone spin of the Great Red Spot. That left the baby red spot deformedand sapped of color as it spun off to the east of the greater storm.Astronomers predict that the Great Red Spot will eventually pull in and absorbthe baby red spot — a possible reason why the super-storm has sustained itspower for so long. Another super-storm, a third one known as the Little RedSpot, safely skirted its larger cousin, and may challengethe Great Red Spot for size. The Little Red Spot?s top winds already equalthose of the Great Red Spot at nearly 384 mph (172 meters per second), and ascientist told SPACE.com in May that the newer contender may be part ofa larger storm system beneath Jupiter?s upper atmosphere. The Little Red Spot first appeared in 2005, after athree-way storm merger turned it from white to an angry red. That means thebattle of Jupiter?s titans may eventually depend on which storm can consume themost fallen rivals.